With a little less than three hours to go for the Nobel Prize 2010 Announcement Ceremony in Sweden, I have decided to enter the race in all the available categories. This post is meant to be read by the arbiters of the Swedish Royal Academy and I do hope that they don’t make the mistake of overlooking me and my remarkable achievements in this regard. I deserve the Nobel Prize for the following compelling reasons. I am an honest man and none of what I write below is falsified. I was the first man in the world to explore the physical properties and inconsistencies of photographic film, paving the way for stronger and more secure forms of image storage. This happened when I was ten years old and I took a brick and promptly broke open a 32-exposure Kodak film, the one that rolls into itself. You know what I’m talking about. I took the spoils over to the National Security Agency in the US of A and explained why they needed to invent digital cameras. They took my advice and the history (future?) of photography changed forever. I hereby nominate myself for the 2010 Nobel Prize in Physics for the discovery, invention and exploitation of digital cameras. I was the first, and perhaps the only man in history to record a ten-second footage of what happens to the facial muscles when excessively stimulated by rock music. The video is available here. This discovery paved the way for the recent improvements in plastic surgery and permanent disfigurement clauses in the constitutions of the almost every country in the world. The very fact that you can walk up to a plastic surgeon and tell him/her that you want to look as handsome and stimulated as I do is a testament to my great discovery. I hereby nominate myself for the 2010 Nobel Prize in Medicine for great advances in plastic surgery. I was the first man in the world to ascertain the true nature of the drug whose comemrcial name is Aspirin. Acetly Salycylic Acid (ASA), as it’s chemically known, was a CIA invention aimed at monitoring the world’s population. Each and every molecule of ASA contains roughly 13 carbon atoms. What the CIA did was replace one of these Carbon atoms with a molecular camera. Anyone who swallowed a pill of Aspirin literally swallowed a tiny camera and gave the CIA complete access to their body’s interior. I discovered this great conspiracy when I accidentally hacked into the CIA’s database when I was five years old by solving a puzzle in a kids’ magazine. (This true life story of mine was then adapted into a movie called Mercury Rising and I made a lot of money out of it.) I brought the whole ASA conspiracy to the attention of the Interpol and they decided to stop the manufacture of Aspirin completely, thus safegaurding the privacy of the world’s population. I hereby, humbly, nominate myself for the 2010 Nobel Prize in Chemistry for revolutionizing the pharmaceutical industry with my own non-traditional ‘drug discovery’. MirrorCracked. I won’t say any more. I’m sure you agree. Well, though I don’t exactly qualify for this award, I would like to bring to the attention of the Royal Swedish Academy that if I’m not given this year’s Nobel Peace Prize, I will sell the other four Nobel Prizes and buy cigarettes and distribute it to freshly-graduated smokers. Read as: 18 year olds. In order to avoid this, I think you should just call it a clean sweep and give me this prize anyway. I will be available for comments and interviews. 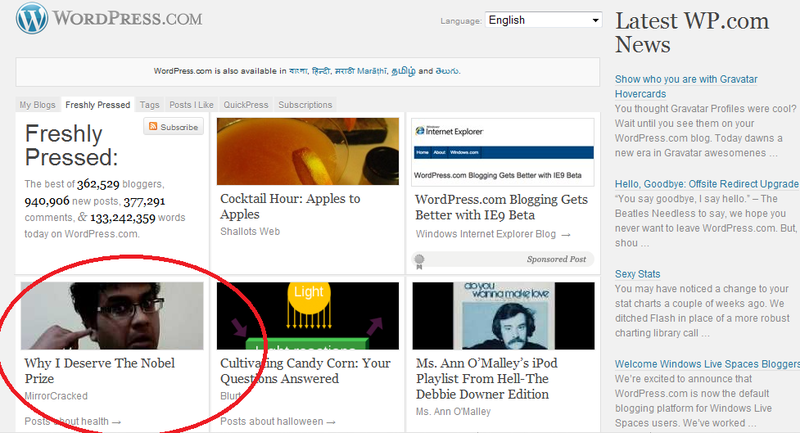 Update: October 8, 2010, 00:01 AM: This article made the wordpress homepage.